The kids on my daughter’s swim team love doing pencil games while waiting for their races. This word search puzzle is for swimmers everywhere! On your mark, get set, SWIM! Click to view and print Swim Meet Word Search full size. 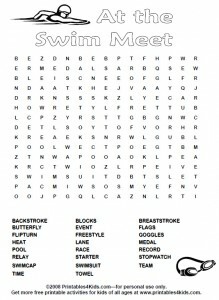 Or you may download the Swim Meet Word Search Puzzle as a PDF file. If you would like to include this printable in your swim meet program, you are welcome to do so as long as the copyright and web address are intact.